Finally, we got our Ahead of the Curve! No, that's not an April Fool's Joke! By the end of Monday night we were really, really tired of this fight. It probably didn't help that it was Monday and we were missing a few people. Also probably doesn't help that we didn't have any hunters, ret pallies, demon hunters or priests - they make things easier! One thing we did have was Ang! 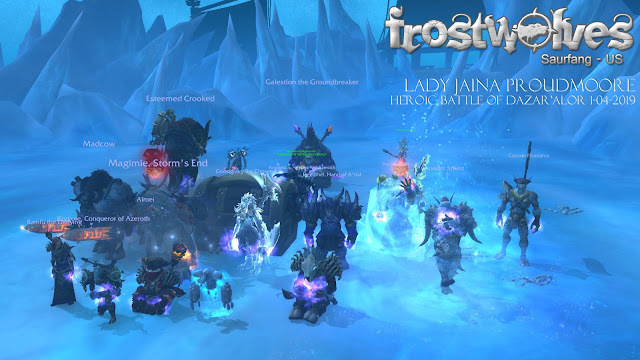 Ang kindly decided to hang out with us today and wipe for 2 hours helping us get Jaina, and after many wipes tonight we got it. We teased Kry for being Elsa a lot, but Tye came late in the day to be our real life Elsa and having a mage helped a bit! We had the warriors breaking us out of ice blocks and we had to wait for the bombs to go off and then do it because we kept killing ourselves with bombs when we were tryign to be broken out of ice. So the last go for the night, we actually did it. I was thinking we would have to do it next week, and we were sooo tired. I think everyone will want to stop raiding now that we've killed that! Sounds like achievement time to me! I bonus rolled a nice ring, so I'm super chuffed about that!